•Braves ranked second in section (Napa Valley Register) Cross Country Express and Matt Duffy get a little plug. With the Beijing Olympics in the rear-view mirror, we are anxious to get the “real games” going, cross country! North Monterey County High School is proud to present the 14th Annual Earlybird Invitational! 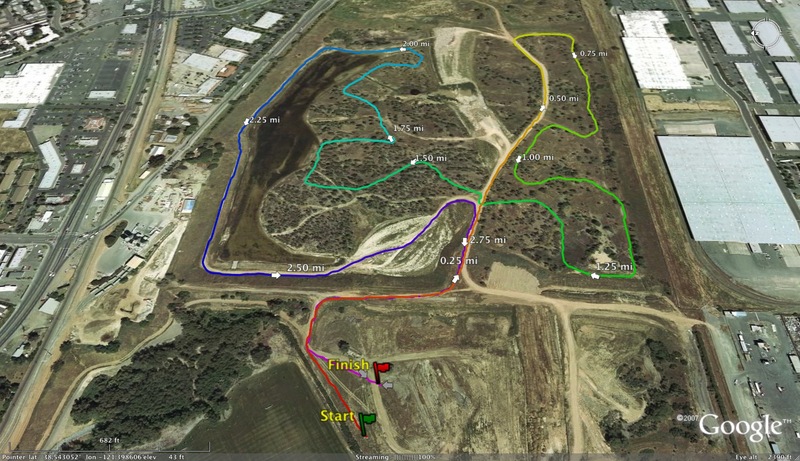 We’re set for a 3rd year at Toro Park (2008 CCS Championships Site) in Salinas during delays on a new course at NMC. It will be bigger and better than ever with more than 70 teams and around 2,500 athletes expected to participate this Saturday, Sept. 6th. 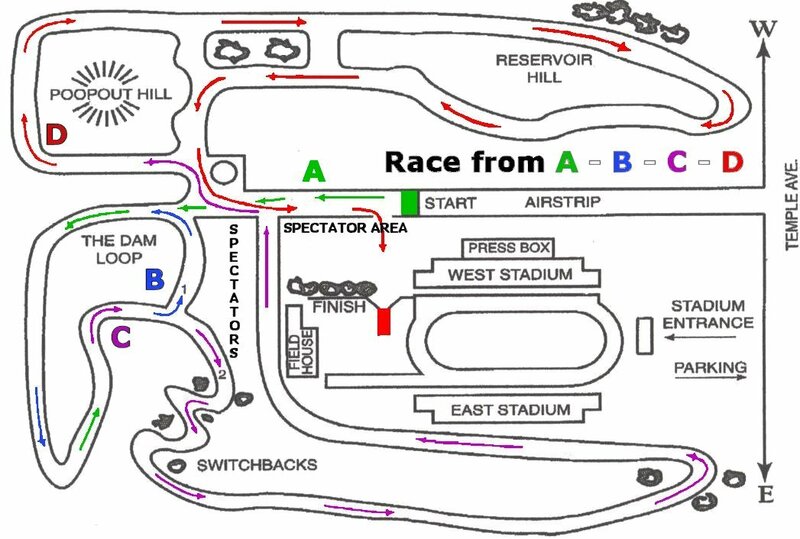 Races will be held by grade levels for both genders with combined team times being used for overall bragging rights. This may be the most competitive early-season meet in the state of California with many state and section ranked teams and individuals. The 2008 edition will welcome our first visitors from mighty Southern California as well as our traditional line-up of powerhouse squads from the north and central part of the state. The Central Coast Section will put on a show with 18 of the top 25 ranked girl squads and 17 of the top 25 boy squads on hand including the top ranked squads in both genders. Hold on! As cross country is a true team sport, we’ll start by highlighting the top teams followed by the top individuals. Let’s get started with the GIRLS. With the Olympics in mind, we have 3 squads that should take gold, silver, and bronze. But, in what order? The two-time defending Earlybird champions from Carlmont are back and come in ranked 1st overall in CCS DI as well as #4 overall in the very elite “CA Super 31 Rankings”! They lost a great senior crew from last year but have some fantastic leaders to carry on. But, they will have their hands full. St. Ignatius was one second back of Carlmont last year and may “Bolt” to gold this year as they return their top 5 and have the defending state champion on board! They are ranked 1st in CCS DIII and may be under-ranked at #28 in all of CA. And our last medal favorite, Mountain View, makes their Earlybird debut and may have a “Phelps like” finish on their first try! They are ranked 2nd in CCS DII and 12th overall in CA. Aptos would like to play spoiler and not be 4th without hardware. They are ranked 2nd in CCS DIII. Leland, with their great sister combo, was 5th here last year and looks to be about the same here with a CCS #3 DII ranking. Gilroy is putting together quite a program with a #2 CCS DI ranking. Presentation took the bronze here last year and comes in #4 in CCS DII. Valley Christian features one of the best up-front runners and comes in #3 in CCS DIII. Host North Monterey County would love to please the host crowd with their #4 CCS DIII ranking. Saratoga will be eyeing host NMC for future CCS showdowns at #5 in CCS DIII. And, keep an eye on San Lorenzo Valley, the most under-ranked team not even showing in the top 25 CCS rankings. That won’t last. Some squads to watch for from out of the area include Clovis West, Enterprise, Escalon, Las Lomas, Madera, Madera South, and our new friends from the southland, Redondo Union. The race for top individual girl honors could be fierce as we have on hand FOUR defending CCS Champs from their respective divisions as well as a different CCS Champ from the spring 2 mile! Also, to make things interesting, one is a two-time CCS Cross Country Champ, the defending STATE CHAMP in DIII, and the Earlybird meet record holder from the course at NMC back in her 9th grade year! The girls will be running in grade level races, so we’ll break it down by class. The senior girls’ race should go down as the most competitive of the meet with 6-7 gals as co-favorites! We have 5 girls on the top 25 all-time list at Toro in this race! All-everything Justine Fedronic (Carlmont) has had some ups and downs but we’re hoping her senior campaign kicks off in fine style and that she’s able to use her 2:11 800 speed on the homestretch. Her 18:24 is #13 all-time at Toro. She’ll have her hands full with defending Earlybird champ Katy Daly (St. Ignatius) who ran 18:32 last year for the top time of the meet. She shocked everyone as a 9th grader three years ago blazing an 18:03 at the North Monterey County course! Her time tied her with Ciari Viehweg, also from St. Ignatius, for the course record. She has won the CCS DIII title twice and iced the cake with a state title last year!! Her 18:23 is #12 all-time at Toro. Watch for her to push the pace early and make it a “Prefontaine style” race. Stephanie Barnett (Leland) was 2nd here last year and also likes to push the pace early. She’s a two time defending CCS Champ and cruised an 18:07 at Toro last year making her #4 all-time at the park. Jennifer Bergman (Valley Christian) came back in grand style winning CCS DIV last year as well as her 9th grade year and topped it with a runner-up finish at state! 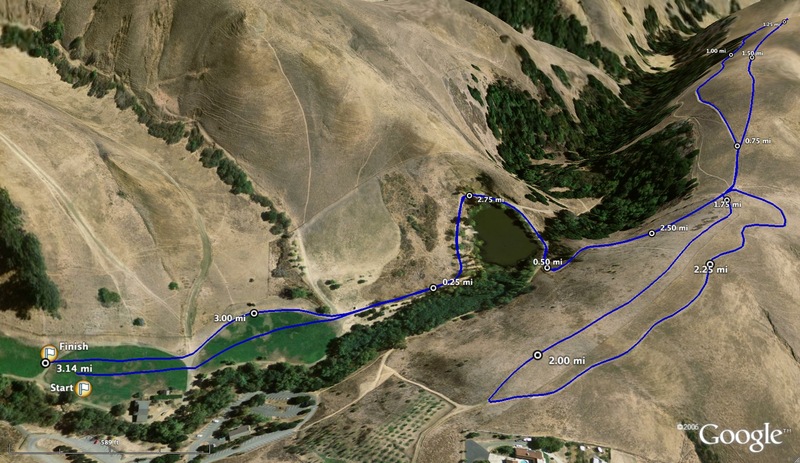 She returns with the fastest time of 17:25 at the historic Crystal Springs course. Chloe Allen (Clovis West) would like nothing more than to spoil the CCS party with her fine 11:06 2 mile good for 14th in state. Hayley Pascale (Carlmont) returns and could sneak in for a podium medal! Her 18:37 at Toro is #25 all-time. Mary Reynolds (Mountain View) has great speed with a 5:01 mile and sits at #19 all-time at Toro with an 18:33. Her teammate, Alex Westbrook, should be along for the ride. Jean Feng (Monta Vista), Kathleen Miller (Gilroy), and Courtney Allen (San Benito) are as solid as they come. Also keep and eye on Kayla Matsuda (James Lick), Katie Nast (Saratoga), Kristine Talbot (Mountain View), Kelsey Johnson (Santa Cruz), Gina Horath (Aptos), Rebekah Phillips (Presentation), and Jerri Spence (Enterprise). The senior girls’ team race may go to Earlybird new-comer Mountain View with St. Ignatius a strong 2nd. Sobrato, Monta Vista, and Presentation should battle for bronze. The junior girls’ race features a couple of “mighty-mites”. Samantha Hamilton (Half Moon Bay), the defending Earlybird Champ, stormed onto the scene as a freshman. The small efficient strider blazed an 18:25 at Toro 2 years ago to win CCS DIV, which moved her to #14 all-time at the park and set a freshman park record! Marissa Ferrante (Aptos) is our pick as the next CCS superstar with 4:52 mile and 10:54 2 mile credentials. She’s another very efficient strider that may make us think we’re seeing double. Chloe Curtis (Redondo Union) and Alicia Brown (Madera South) both ran a 2:11 800 and went sub 5 for the mile and could take the gold, especially if the pace is slow early on! Jovita Trujillo (North Monterey County) was good for silver last year and continues to lead the host school. Georgia Cottong (Carlmont) shocked with a 4:58 mile. Carina Mendoza (Madera) should represent the valley very well. Jessica Hopf (Gilroy) won bronze last year. 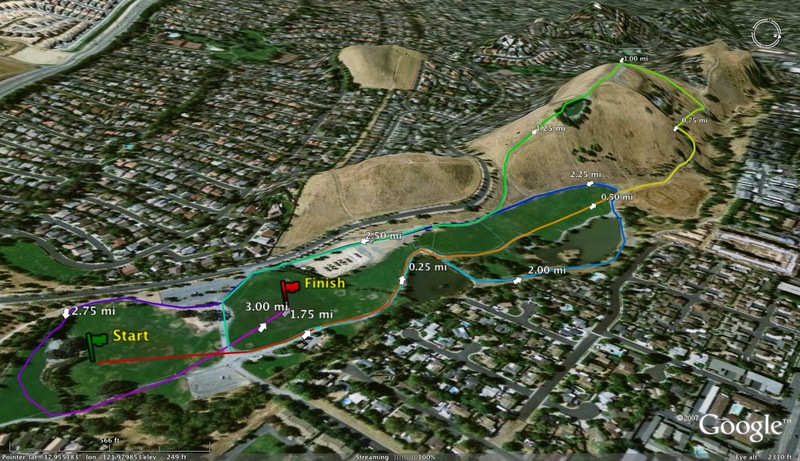 Transfer Kendra Higgins (Valley Christian) won an Earlybird race while at Sobrato. Keep an eye on rising stars Claudia Barnett (Leland), Nadine Huerta (North Monterey County), Libby Brokaw (Las Lomas), and Peral Rivers (Escalon). A re-match of the best team race last year will entertain as St. Ignatius won on a 6th runner tie-breaker to Saratoga and were followed by Las Lomas only 1 point back!! And, Notre Dame-San Jose could steal the whole show!!! The sophomore girls’ should be led by mega talent Rachel Hinds (St. Ignatius). She burst onto the CA running scene last year with her 18:56 race win here, a CCS DIII title, and an 8th place in state! Noticeably absent during track, she will once again run over hill and dale. But, if track has helped anyone, it has thrust Jesse Peterson (Carlmont) right into the role of co-favorite here. She was 30 seconds back and 2nd to Rachel here last year but cranked a 10:56 2 mile to win the CCS title! Flip a coin folks! Hannah Farr (St. Ignatius) returns to try and nab another top 3 finish. Akaysha Tahliwal (Madera South) has had a great summer and could surprise. Tanya Naranjo (Santa Cruz) returns, as do Amanda Schallert, Bridget Sullivan, Jacquelyn Urbina, Allison Siu, and Caileen Viehweg all from St. Ignatius! St. Ignatius will put on quite a show here. Last year they had a perfect 1-5 team sweep and a score of 15 to romp the competition! That’s unheard of in fields this size!! Leland looks to repeat with silver and Los Gatos and Presentation for bronze. The freshman girls’ are a mystery but some teams will rise in stock very quickly after this one is done. The BOYS will put on a show with the highest quality field ever assembled at Earlybird! Many state and section ranked teams and individuals highlight the meet. If that’s not enough, how about a CCS preview? 7 out of the top 9 ranked CCS teams are here! And, 5 teams in the “CA Super 31 Rankings” will toe the line in the first week of September! 2002 Champs? Madera. 2003 Champs? Madera. 2004 Champs? Madera. 2005 Champs? Madera. 2006 Champs? Madera. 2007 Champs? Madera! Well, we thought the streak would end 3 years ago as well as last year and the Coyotes came through like the champs that they are! But, all streaks come to an end and this may be the end of the greatest run in Earlybird history. Mountain View makes their Earlybird debut and they lead 5-6 teams that may spoil the Madera party. They come in ranked 1st overall in CCS and 12th overall in CA! Redondo Union makes history as the first Southern Section squad at Earlybird and may take gold ranked 14th overall in CA! Flip a coin between DIII state powers Aptos, ranked 23rd in all of CA, and Willow Glen, ranked 24th in all of CA after placing 3rd and 4th in state last year! Bellarmine cracked the “Super 31” state teams at #31 and are ranked 1st in CCS DI. St. Ignatius is always lurking ranked 3rd in CCS DIII. Carlmont took some graduation hits but re-loaded nicely at #2 in CCS DI. Palma has developed some depth to compliment their leader at #1 in CCS DIV. San Benito and Serra will like to play spoilers as the #3 and #4 DI CCS schools. Madera has a great leader, will take their hits, and keep on fighting. Madera South joins the party and is led by their new coach that guided Madera during their current Earlybird win streak! Monterey, Sobrato, Los Gatos, Leland, and Evergreen Valley should also fare well. Host North Monterey County graduated 6 out of their top 7 but did not sulk over the summer. And, Clovis West, Enterprise, Las Lomas, and Escalon didn’t drive this far just to show up. The senior boys’ race should be quite special with seasoned Earlybird veterans clashing with some out of the area newcomers! Tyre Johnson (Palma) had the breakthrough performance of the meet last year and will seek to repeat as Earlybird Champ! He has a 15:27 Toro time, good for 8th all-time, to his credit. He later cruised a 9:17 2 mile and unfortunately most did not notice that he placed 2nd to German Fernandez (Riverbank) at state as German set the Woodward Park record of 14:24!! German has since gone on to legendary status breaking the national 2 mile record with an 8:34!!! Cody Schmidt (Redondo Union) cruised a 9:10 2 mile and is ready to win Earlybird on his first try. Lance Wolfsmith (Sobrato) won as a sophomore and was 2nd last year. I’m sure he would like to go out on top. Rylan Hunt (Aptos) is poised to have a spectacular senior year after a bit of roller coaster career. His 4th place at state in the mile and a 4:13 best has him on quite a rise. 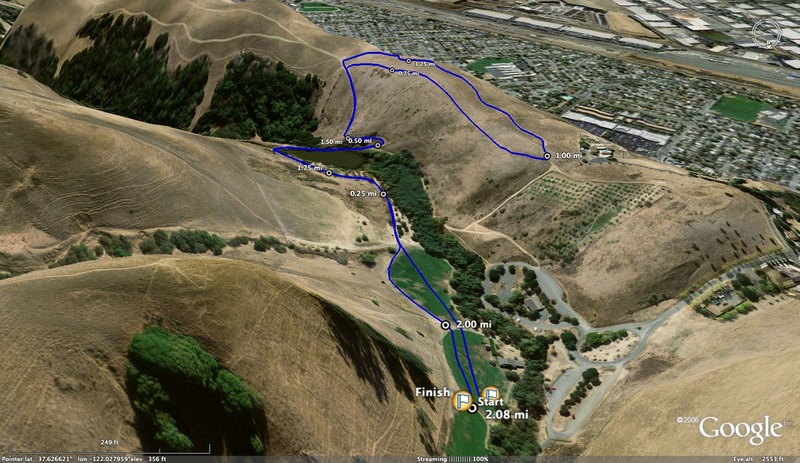 And, his 15:43 at Toro for #17 all-time shows he knows how to run this tricky course. Jesse Arellano (Madera) had a historic freshman debut at Earlybird with a freshman record by 21 seconds with a fantastic 16:21. He was a bit off as a sophomore but bounced back with a 3rd place run last year. Senior year may be the cherry on top. Nohe Lema (Willow Glen) has taken the mantle of leadership and may have the greatest up-side here. Cody’s twin, Simon Schmidt (Redondo Union), will make you scratch your head as you see double. Brennan Lynch (Santa Cruz), Dayne Gradone (Aptos), Jake Arveson (Monterey), Alan Menezes (Saratoga), Greg Innes (St. Ignatius), Kian Banks (Saratoga), Chris Pedro (Carlmont), Lawrence Smith (Bellarmine), Valentino Julien (Willow Glen), and Peter Birsinger (St. Ignatius) complete the power packed line-up. The senior team battle will be fierce with Bellarmine seeking a repeat win and Willow Glen, Palma, and St. Ignatius chasing. The junior boys’ race will have Gregory Harper (Las Lomas) going for his 3rd Earlybird win! 17:06 2 years ago, 16:29 last year, maybe sub 16:00 this year? Dalton Guthrie (Bellarmine) missed the win by one second last year and may know how to beat Gregory now to end the streak. But, Gregory and Dalton may be out of luck. Garrett Rowe (Mountain View) makes his debut and should end the streak quick if he’s healthy. He was 5th in state last year and breezed to a 4:22 mile. His teammate Ian Myjer is also a rising star to watch. Kellen Levy (Clovis West) went 9:34 for 2 miles. Mitch Moriarty (Aptos) will carry the torch for his team next year. Also watch race veterans Nathan Lee (Carlmont), Zach Kaylor (Enterprise), KC Green (Las Lomas), Alan Rios (Sobrato), Nick Olsen (Saratoga), Miguel Gallegos (North Monterey County), and Michael Reher (St. Ignatius). Remington Besnoin (Redondo Union) joins the party this year. Las Lomas asserted themselves last year in this team race and Monta Vista, Serra, and North Monterey County will give chase. In the sophomore boys’ race Domenic D’Aquisto (Enterprise) returns to go for win #2. He ran a fine 17:10 last year and will need to go sub 16:30 to hold the contenders at bay. He blazed the track with a 9:28 2 mile at state as a 9th grader! 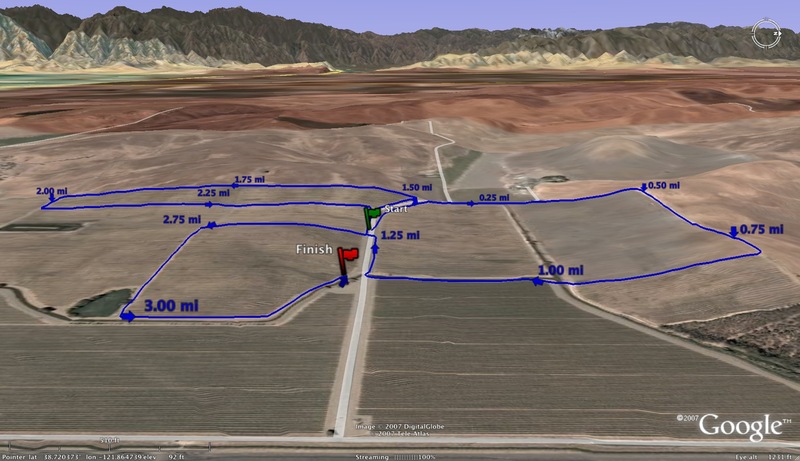 Isaiah Lorenzo (Madera South) was just off of that with his 9:34 2 mile! Carl Gracely (Las Lomas) was only 3 ticks back of the win last year. Ben Bunk (Carlmont), Jesse He (Monta Vista), and Kevin Xie (Leland) return to challenge. Watch Jose Castillo (San Benito). He was only 15th last year but should move up this time around. Carlmont returns to defend their team title but will be challenged by San Benito and Las Lomas, Monta Vista, Bellarmine, and Madera South will also contend. The freshmen boys’ race will just keep us hoping they don’t go the wrong way. Since the meet will be at Toro Park once again, we’ll keep an eye on the clock and see the Toro Park record books take some major hits. Matthew Petrillo (Los Gatos-2006) holds the park record at 15:12. We think there are 2-3 guys in the field that could flirt with that, especially later in the year! The boys will have to dip under 15:51 to make the all-time top 25 list. We’re looking at 6-8 guys that could do that this weekend! Tori Tyler (Gunn-2004) blazed a 17:16 and threw down a mark that will be hard to challenge for quite some time. To give you some perspective, #2 on the all-time Toro list is 17:53! To make the top 25, the girls will have to run 18:37. We’re looking at 4-5 girls that could do that here! As far as team time records are concerned, Los Gatos boys ran a course record of 80:45 2 years ago. The 16:09 average for their scoring 5 may be safe for now with challenges coming later in the season. The girls’ team time record of 96:01 also set by Los Gatos 2 years ago doesn’t seem as safe. Averaging 19:12 for their top 5 girls is quite special, but, if Carlmont comes in healthy, watch out! Good luck to all and we hope you enjoy the meet! 2008 EARLYBIRD WILL BE THE BEST EVER, GUARANTEED! Visit our meet website for coverage! 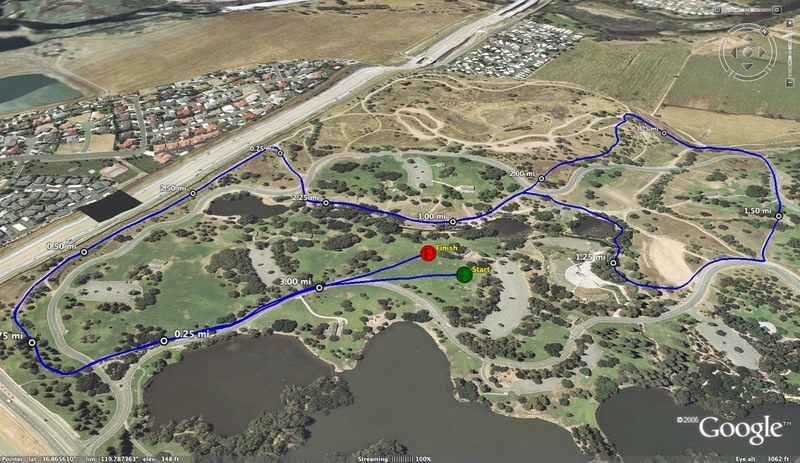 http://nmcxc.tripod.com/ and http://www.dyestatcal.com/will be on hand! School will be off and running on Wednesday and I will not be posting for a couple of days. I will post the Division V pre-season rankings for NCS and CCS when I return. Clinic notes from the 2nd Annual Maine Coach & Athlete Cross Country Clinic. The author will post more information throughout the week. Here is his first entry. If you are hoping to watch the 1500 Final on TV and not know the result, then read no further. Well, it wasn't the race we were all dreaming would happen. But life and especially athletics are not a fairy tale stories that you get to script. Shannon gave it a good run and ended up 7th. Crazy how that is a bit of a letdown?! 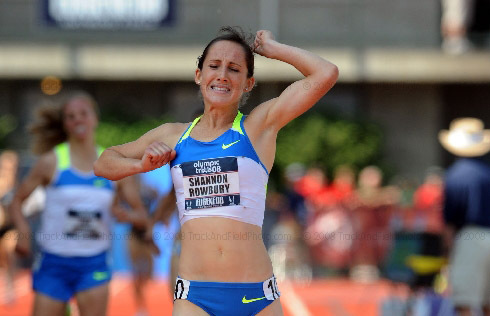 I got an e-mail from Ruth Wysocki (1984 Olympian in the 1500) that said Shannon's 7th is the highest finish by an American in Olympic 1500 history (she thinks). 7th in the Olympics! Wow! Shannon was well positioned in 4th/5th for the first 2 laps but infortunately it was a slow pace (65 and 68 for 2:13 at the 800). That meant it was a large pack together at this 4:03 pace. 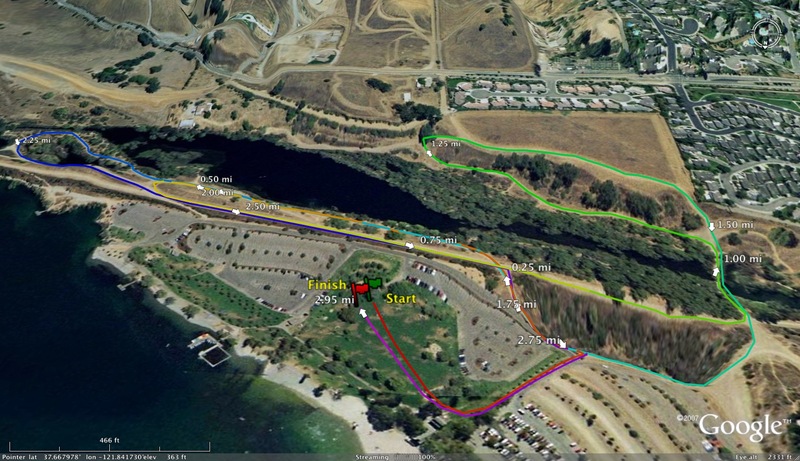 In my opinion, it would have been better if the race were strung out a bit at a faster (4:00) pace. Quick track strategy lesson for those who are asking "if Shannon wanted a 4:00 pace, why didn't she go out and lead the race at that pace since she knows she can run that fast?" The answer is that it takes a lot of energy to lead a race (physical and mental) and to lead the pack at that pace usually (99% of the time) leads to others passing you and running 4:00 and you fading to a 4:06. Back to tonight's race. With 500 to go Jamul surged hard. I thought that was the key moment and Shannon had to respond. Unfortunately a gap opened between Shannon in 4th and the top 3. But it wasn't over. Shannon kept fighting. Others were with her. And sometime in the last 200, a Kenyan runner took the lead and Jamul (the big big favorite) fell back to 5th. Shannon was 7th in 4:03.58. I haven't talked to Shannon yet. She smiled and waved at the camera when she was introduced so it appears she was relaxed and enjoying the moment. I watched through binocolars as she did an interview after the race and she seemed to be smiling and at the end got the interviewer to laugh, too. The only thing better than her running ability is her class act! Her plans after the Olympics were to stay overseas (Europe) and run a couple more races. I think this will be good international experience for her. It was an emotional day. I read a great e-mail blast from SHCP letting the whole community know about the 1500 Final. Then I was in the middle of reading an e-mail from an SHCP alum from the class of 2003, thanking me for coaching her and saying all kinds of nice things about how Shannon represents everyone who's ever run for me, etc. I was all teary-eyed and then my cell phone rang and it was Shannon, wanting to get some info from me so we can go into the Olympic village on Mon. It was a real honor to get to talk to her and give her some advice the morning of her race. Well, 2 more days left in China. We were originally going to watch the men's marathon on TV but I just scouted the course on the map and I think we can easily get to a couple spots on the course between 25-35K so we are going to get up early and see what we can see. We still have Summer Palace, Peking Duck for dinner, wathing the Closing Ceremonies on TV, shopping at Silk Street, seeing the Olympic Village with Shannon, and seeing if there are any Olympic souvenir sales the day after on our to do list. It's been a great trip but Malinda and I are both looking forward to going home. This travel stuff in a foreign country and not speaking the language is tiring! But I wouldn't have missed this for the world! Not sure if we'll be sending out any more messages. If I don't send any more messages, thanks for reading. It has been a memorable few weeks and it's been very special to share the memories with our closest family and friends - our immediate families, the SHCP community, and the Pamakids Runners. I look forward to sharing Olympic stories with another of my extended families when I get home - my current Irish cross country and track & field teams! We had computer troubles last night after Shannon's 1500 and were unable to send out anything. By now I assume it is pretty old news that she qualified for the 1500 Final. She was in the 3rd heat and her heat was by far the fastest. She came in 4th and qualified on time. What's most interesting is that of the 10 so-called medal contenders that I publicized on my chart, only 3 are still standing (guess I am not so expert). The 3 Russians were DQ'ed for doping a month ago, 2 did not enter the 1500, and 2 did not qualify out of the semi-final. The big three are Shannon, Jamul (Bahrain), Lishchynka (Ukraine). 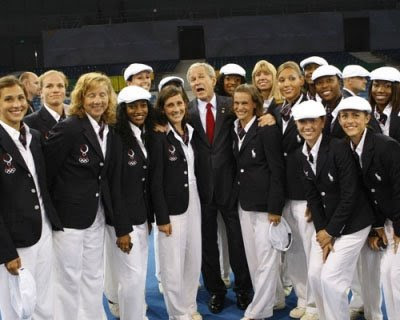 Of course there are 9 other women in the race chasing those precious medals, too. I am hoping for a fast pace....if the leaders are on 3:59-4:01 pace, I think Shannon can beat some people by being faster than them. If it's a slow pace, anything can happen and things like international experience and your final kick speed become more important. We'll see. It's pretty exciting to be here thinking about the possibilities. Malinda and I made a banner to wave around at the Bird's Nest. We bought the material on Wed and then Thur morning had to go running in the rain to the Chinese equivalent of Target to get permanent markers to finish our art project. I will attach the photo in a separate e-mail because it's a large file and I don't want the computer to crash. - We can't believe both the men and women's 4X1 dropped the baton. It was ugly and pretty embarassing as all the foreigners in the stands around us were giving us a hard time. I came up with the idea that the US should send the NCAA champion 4X1 team to the Olympics/World Championships. Let the Tyson Gay's concentrate on their individual events and let a college team that works together on the relay all year and would be willing to focus all their energy on just the relay, run it. - The 1-2-3 US sweep in the 400 was bizarre because Jeremy Wariner was clearly disappointed and did not fake being happy very well. 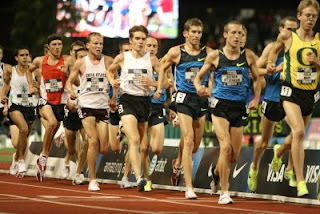 - The men's 200 from a couple days ago had a ton of controvery. Usain Bolt's WR 19.30 was easily 1st and again amazing. But the original 3rd place (US's Spearman) was DQ'ed for stepping on the line. The US protested. While reviewing the protest officials decided that the original 2nd place (Charunday something) should also be DQ'ed. So Amercians Crawford and Dix (originally 4th and 5th across the line) were awarded the silver and bronze. Both looked awkward and uncomfortable on the medal stand. - Today (Fri), we saw some boxing and volleyball. The men's volleyball semi-final (Brazil over Italy) was quite exciting as the fans for both sides kept singing/cheering throughout the match. Well, I am off to bed now. Sat is going to be a big day. 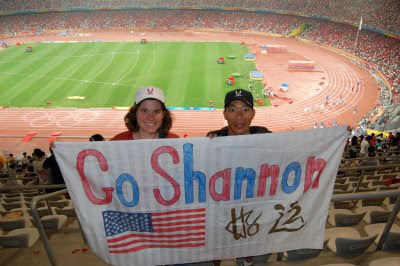 Shannon races at 7:50pm Beijing time, so 4:50am in SF. I am not sure when it will be broadcast. Shannon's mom told me that NBC did an interview with Shannon the other day so if that interview hasn't been shown yet, maybe it will be part of the lead-in to the 1500 Final race coverage. It's hard to believe this is all happening. I met Shannon about 10 years ago this week. I was in my first weeks as the SHC cross country coach and she was a freshman who decided to come out for the sport, despite having no running experience. And 10 years later she's running the the Olympic Final and I am in China to see it! I just borrowed Shannon's latest SFGate blog title. It is quite appropriate. Her first Olympic race is in less than 24 hours. Malinda and I had lunch at the Noodle Loft with her, her friend, and parents on Tue. Tonight (Wed), we talked on the phone....I have called her many times in my life but never to wish her luck the night before an Olympic race so I wanted to do that tonight. I told her about my planned call to the SHC faculty and staff meeting on Thur and the possible 4:00.33 time trial at Kezar Thur night by Coach John Spriggs.....she defintiely thought it was all cool. After all the anticipation, it all comes down to the next 72 hours. The beauty is that although the Olympic experience has been different, she is an veteran at handling herself the last 72 hours before a major race. - The large number of people everywhere you go (especially on the subway) and all the time. - No 4th floor at most places (the number 4 is unlucky in Chinese). - The fact that we are paying 2 RMB (28 cents) to ride the subway and 1 RMB (14 cents) to ride the bus. That is when we are paying. On days we have Olympic tickets, public transportation is free. - Across town taxis are 70-80 RMB (or approx $10). - The high concentration level that it takes to safely cross the street, avoiding collisions with bikes, mopeds, cars, buses, and other pedestrians. - We are also getting used to (but not liking) hearing the Olympic theme song almost non-stop and watching 95% China athletes when watching Olympic coverage on TV. - There's no good food at the track meet....no garlic fries and polsih hot dogs (I miss AT&T park)! - The Chinese are missing some great consumer opportunities - they are not selling a meet program at the track and the souvenirs are actually reasonably priced. They actually close the gift shops early to get people to leave - talk about missing the boat from a money-making perspective. - Most restaurants close at 9pm. We've had to search for food after the meet (Ramen noodles the first night). We attempted to get Peking Duck last night but arrived a couple minutes past 9 and were denied. - We've gone shopping with Monica Z, been to the Forbidden City with Frank, and eaten numerous meals with Tower and his family. - Tonight we saw some Chinese Acrobats perform. - We've become regulars at the Hometown Hopefuls Hospitality area. The free massages, meals, and ice cream keep bringing us back. - We've become real pin traders. I had plans to trade pins all along but it was slow getting started. But while shopping at the official Olympic souvenir store (picture IKEA), the women working kept stopping me and asking to trade pins that I had on my lanyard. Since then we've been on a roll. The Chinese love this Tyson chicken pin that we picked up at the Trials in Eugene. We were literally mobbed at a department store today because of our pins. - Mon night we saw a world record in the pole vault by Yelena Isinbaeva, which was a real highlight. - We've also become buddies with Shalane Flanagan's mom, Cheryl (herself a former American record holder in the marathon). We seem to bump into her everywhere. Talk about a modest mom....you really have to drag it out of her that her daughter won a bronze medal in the 10,000. - But the best track story so far comes from Frank. He was watching the women's marathon on Sunday and started running around with a group to watch the race unfold. After awhile it was just him and another guy who could keep up. Turns out that "other fast guy" was Magdalena's husband Richie (sub-4 minute miler) Boulet. Frank did not say if he told Richie he was the Pamakid club record holder in the mile race walk. But it will be pretty cool when at the next PA race, Frank can go up to Richie at the start line and say, "Hey remember me? We ran around together in Beijing and you gave me a ticket for the finish of the marathon in the Bird's Nest." The newest pictures will probably be on page 2. From the number of new people requesting to be Pamakid Yahoo Group members, I guess you need to be a member to see the pics. Sorry if you are not. If you want to see the photos, submit a request. Both me in China and John Spriggs at home can approve your request and you can quit our group after the Olympics and we won't be offended. Well, if you can't tell, we are having a great time (it is our honeymoon). 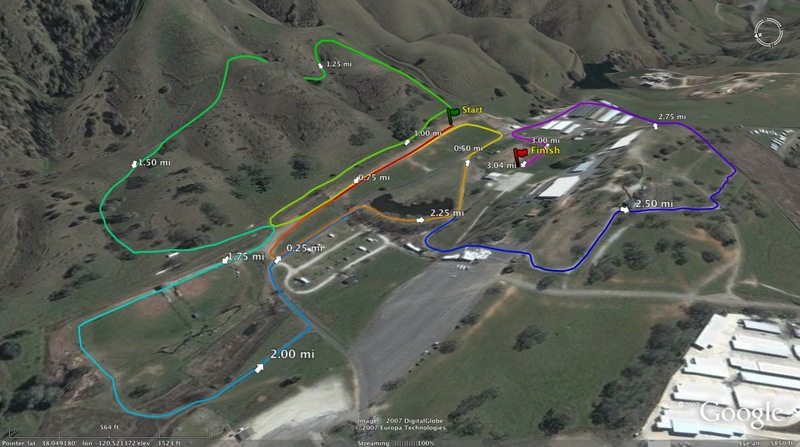 I have this excited/nervous feeling in my stomach for Shannon's races, which is also nice. We bought some fabric to make a banner and tomorrow we are going looking for red and blue sharpies. Look for us on TV....we'll be the obnoxious Americans screaming our heads off for Shannon and waving our Go Shannon banner from the 3rd tier of the stadium. BEIJING — The United States waited four days for its first gold medal in track and field. The breakthrough came in the women's discus. The training. The conditioning. The weightlifting. The mental preparation. The years of hard work. 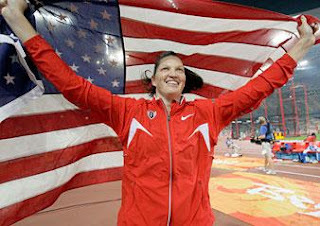 They were all put to the test this morning as Stephanie Brown-Trafton of Galt competed in the final of the women's discus throw at the 2008 Olympics in Beijing. The final took place at 4 a.m. today, but the event is scheduled to be part of NBC's prime-time broadcast from 9 p.m. to midnight this evening. Malinda and I are having our first Olympic experiences. On Sat night we watched the Men's 100 on TV. Even in Chinese, Usain Bolt was fast! 9.69 and he was celebrating the last 20-30 meters. You won't see an SHC sprinter not running through the finish line like that! Then Sun morning we were able to watch the Women's marathon on TV. Too bad about Deena and Magda. We came back into Beijing and on our way to pick up some more tickets we see an American woman walking on the street and Malinda goes "Is that Shalane's mom?" 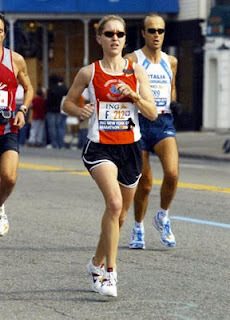 Shalane, as in bronze medalist and American Record holder Shalane Flanagan. Because Shalane has the same coach as Shannon, we've gotten to know Shalane's mom. So standing on a street in the middle of Beijing we got a first hand account from mom on her daughter's 10,000. Shalane's mom is a former American record holder in the marathon so she knows the sport but still, you could feel her excitement and pride in her daughter. It was very cool. We rushed to the Bird's Nest on Sun night to catch our first Olympic competition. What a place! I'll have some flip videos to show when we get home. Bolt's medal ceremony, World Record in the Women's Steeplechase, 1-2-3 sweep in the Women's 100 by Jamaica, Lagat not making it to the 1500 Final, more hammer and triple jump than I've ever watched, and a 2nd straight 10,000 meter gold by Bekele (53 last lap; Gebriesallasie gave it a good fight, led for a lap late but faded to 6th). The Jamaicans and the Ethiopians were going nuts in the stands when their athletes did well. All very cool. On the way out we spotted a crowd of Chinese around a tall black man.....it was Lopez Lomong (US 1500 runner, US flag bearer for the Opening Ceremonies, and one of the "Lost Boys of Sudan" of HBO documentary fame - Shannon seems to be good friends with him). I like Lopez a lot so it was nice to get a picture with him and shake his hand (I told him he did a good job holding the flag). According to the IAAF schedule (www.iaaf.org), there is no Women's 1500 prelim on Aug 19....so I think it is cancelled. This iaaf website is the best place for schedules and results. If you have time, enter their fantasy league - maybe you can beat the Track Widow or the Chanman. We're in a Holiday Inn Express with free internet (and laundry - thank God), so time permitting there should be some good updates coming. I'm almost disappointed Shannon's 1st round race was cancelled...I am getting anxious to see her race in the Olympic Games! Today Malinda and I went back to Beijing for a day. It actually rained today. Tomorrow we plan to go to the Great Wall. We met up with Tower's family again and we talked on the phone with Monica today and made plans for next week. I think Frank is leaving within hours, so soon our Pamakid Family will be over here! Right now we are at the Bank of America Hometown Hopefuls Family Center - where we got a goodie bag, 2 Olympic tickets for volleyball semi-finals, free laptop checkout, and free food! Everyone is real friendly and it's fun to feel a part of something big and special. We ate dinner with family members of a top US boxer. Attached are a couple photos. One is from Dalian when we saw Shannon yesterday (I sent this to the Pamkids already) and one Shannon's dad, Gary, sent out...Shannon with a certain President (picture above). There is a rumor that Shannon's Aug 19 quarterfinal might be cancelled and all the athletes advance to the semi-final on Aug 21. So pay attention to listings. The USATF site (www.usatf.org) and Let's Run (www.letsrun.com) are two good resources. We think we've successfully picked up some more Olympic tickets. In addition to the volleyball we got just now as a "family member" of an Olympian, we think we've made arrangements to buy tickets from a high school coach from LA who I talked to on a message board and has some tickets....including for the 1500 final (Tower and Frank may have hit the jackpot!). It's been a lot of travelling the past week. We have 3 more days of it and then we settle down in Beijing at one hotel for the rest of the trip. At that point we'll be in full Olympic mode. My coaching history includes a coaching stint (basketball) in this division when I was an assistant coach at Half Moon Bay HS in the mid 90s. I am very familiar with this division as the majority of the teams are long time members such as HMB, Palma, Carmel, Robert Louis Stevenson, and Pacific Grove. The best boys' team returning this year will be Palma HS. following their 2nd place finish last year in CCS behind a senior loaded King City team. Palma returns their top 6 including the defending CCS champion, Tyre Johnson (15:08), which means they should be starting out their team score with a possible 1. 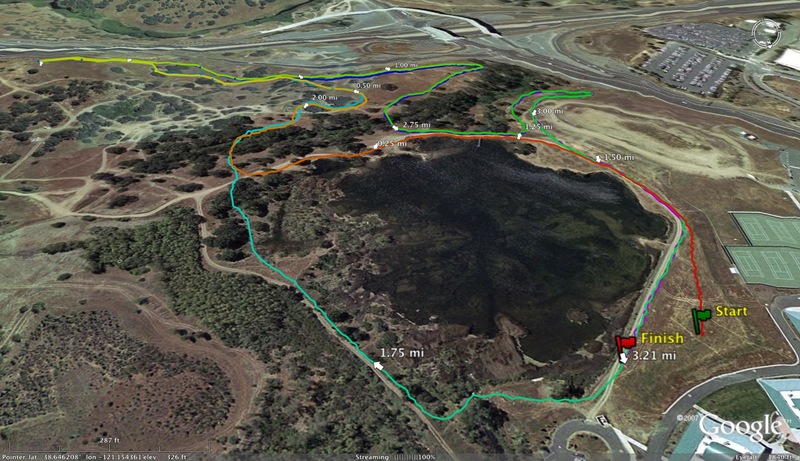 They will also get to race the section race at Toro Park which should be to their advantage. Their closest pursuers should be Carmel HS, a consistent threat in this division. Carmel has not only done well in the section but at the state level as well including a state title in 2003 (3rd in 2001, 4th in 2002, 1st in 2003 and 2nd in 2004). Carmel returns 5 out of their top 7 including their 2-4 runners who all have the potential to run under 17 minutes on the Toro Park course. The battle for the final state meet berth should come down to the following teams. Half Moon Bay has a very strong front runner in Bryce Williamson as well as a great middle school feeder program which could shortly be tapped out following the retirement of their long time coach, Howard Clemente. San Lorenzo Valley and King City have been strong performers consistently in this division and looking at their track results should be contenders here as well. The battle for the individual title starts and ends with Palma's Tyre Johnson. 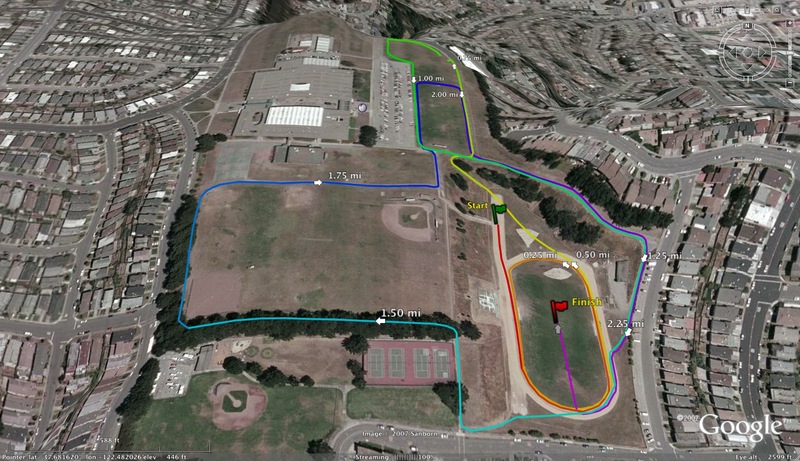 He is the defending champion as he posted an impressive 15:08 in a solo effort at last year's CCS championship race. His closest pursuer and 2nd place finisher from last year is Brennan Lynch of Santa Cruz. Lynch posted some impressive times during track season but there is some ground to be made up to challenge Johnson. The girls' favorite will be the defending champions, Carmel HS who like their male counterparts have done well at the CCS and state levels. Carmel's victory last year was not an easy one as 6 points separated the top four teams. They just edged 2nd place Valley Christian SJ (81-82) last year but VC will be testing the waters at the Division III level this coming season. 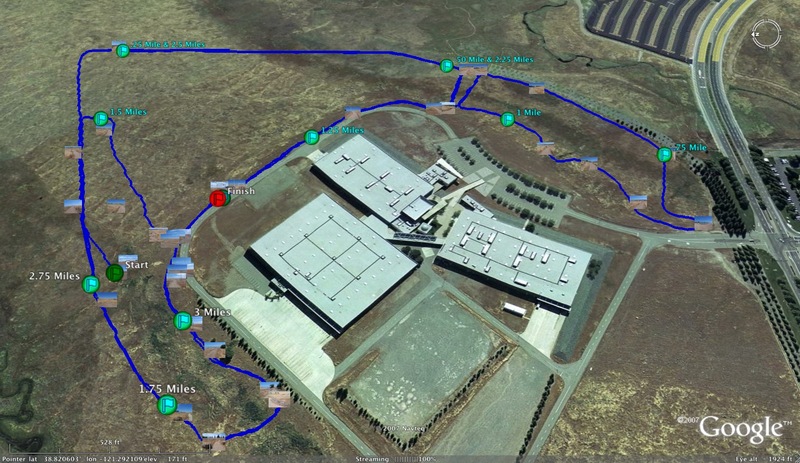 Carmel will return two very strong runners (Melanie Hong and Jessica Fenton) who both were in the very low 19s on the Crystal Springs course last year. Carmel's challengers should include Santa Cruz who return their own dynamic duo (Tanya Naranjo and Elle Sanders) but will need help from their supporting cast. San Lorenzo Valley has been a major contender for the past decade in Divisions III and IV and despite some key losses should contend here as well. Kings Academy and their talented 800 runner (Priya Pappu) and Half Moon Bay with the individual title favorite, Samantha Hamilton, should also be in the mix. As just previously mentioned, the individual favorite will be Hamilton of Half Moon Bay. Her road to the title improved immensely as the defending champion, Jennifer Bergman of Valley Christian SJ, will now be competing in Division III. Last year's 3rd place finisher, Annie Lee of Robert Louis Stevenson, and Carmel's Melanie Hong appear to be her closest pursuers but as in all girl's races, a talented 9th grader could challenge for an individual title. 1) Palma-Tyre Johnson leads way to possible championship. 2) Carmel-Consistent contender in this division. 3) San Lorenzo Valley-One of several contenders for final state meet berth. 4) King City-Defending champions looking to return to state meet. 5) Half Moon Bay-Will need help from incoming freshmen. 1) Carmel-Defending champions looking to repeat. 2) Santa Cruz-Tanya Naranjo will lead the way. 3) San Lorenzo Valley-Can't count them out despite key losses. 4) Kings Academy-Looking for 1st state meet berth (I believe). 5) Half Moon Bay-Incredible string of success in this division. NCS and CCS Division V predictions will be up next. Feel free to comment on the above rankings. Thank you to Walt VanZant for all his team comparison data that you can find at the following link. Malinda and I are checking in from Dalian, where the USATF has a special training camp for its athletes. It's a nice place but talk about HIGH security!! Shannon had to do a lot of talking to get us in for a couple hour visit Wed afternoon. We helped her pass some time by showing her pictures of our travels so far (Beijing to Xi'an (Terra Cota Warriors) to Shanghai and now to Dalian). Then she and I had a quick talk about her scheduling from now to the end of the Olympics and I hopefully gave her some reminders that will help her relax and feel confdent. Still almost a week to go until the racing begins for her and I can tell she can't wait. This email is to inform you that I have resigned my positions as mathematics teacher, cross country head coach and track and field distance coach at Skyline High School. I have accepted the position of head coach of cross country and track and field at Dublin High School and a mathematics teaching position in the Dublin Unified School District. I have enjoyed every minute of the nine years I have spent helping to build Skyline into the successful program that it is today. Over that time, we won four Oakland Athletic League (OAL) girls cross country championships, two OAL boys cross country championships, seven OAL girls track and field championships and three OAL boys track and field championships. I was privileged to have worked with twenty three individual league champions (eight in cross country and fifteen in track and field) and seven of our student athletes who moved on to participate at the collegiate level. I am very thankful to the administrators, athletic directors, coaches, faculty, staff, parents and mainly the student athletes who helped support this program and make it into a family like atmosphere. I wish Skyline the very best in the future and I am looking forward to the challenges that will present themselves at Dublin High School. For anybody that watched the opening ceremonies last night, you were in for quite a show. If the Chinese athletes compete with the precision of last night's performers, the rest of the world is in trouble. Here is a picture of Shannon Rowbury during the opening ceremonies courtesy of her dad Gary. 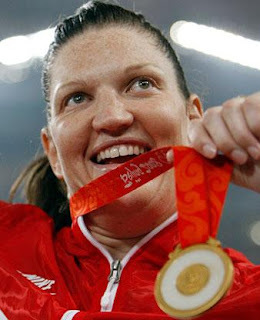 Her chances of medaling are very good following the disqualifications of the Russian athletes. The Redwood Empire includes the following: The North Bay League (Mostly 3A schools), Sonoma County League (2A) and the Coastal Mountain Conference (1A). ]www.shannonrowbury.com website has been launched. the fourth fastest American of all-time. I can't believe we're here in China. This trip has always seemed so far away. It's been months and months of talking about this trip. When it started years ago, it was just an idea. Then in January, when we booked the trip, it was a great honeymoon with the possibility that Shannon would make the Olympic team (she was “an underdog trying to sneak in" at that point). In May when she ran 4:01, things changed and there was now a good chance she would make it. But even when she qualified at the Trials on July 6, it didn't really sink in. This last week, when I started saying “we leave on Saturday," it finally sunk in. Lots of great coaches who run terrific programs and have coached a long time, never get a 2-time State champion athlete like Shannon on their team. It seems almost unfair that I got to coach Shannon my first 4 years as a head coach. Lots of high school champions do not go on to collegiate success and even less continue on as professional runners. There are many professional athletes who are not Olympians or US Olympic Trials champions. And many Olympians who are not medal contenders. That's what's incredible. I feel blessed and fortunate that these things have all happened and that I am still involved in helping Shannon. Other coaches (especially high school coaches) really understand how cool and amazing this is. I feel genuine happiness for how proud I am feeling. It's been so much fun to share how I am feeling with people like Margi Beima, Coach Fran, Ed Nevus, and Tony Kauke. And I've never had so many people wish me safe travels! As a coach, my goal is to have a successful program. You do the best job you can with every kid and every team. The passion and hard work you put into it often gets unnoticed – but that's okay because the reward is the relationship you build with the kids. Whether or not Shannon ever came along, I think I'm a pretty good coach with a pretty good program at SHCP. I do the same things today that I did when I coached Shannon (OK, maybe I can't keep up with my varsity runners like I did ten years ago – that age thing!). Thanks to Shannon's accomplishments I've been recognized and thanked a lot lately. I admit it's been real nice but again I think a lot of this has been just good luck on my part. Those are the thoughts I've been having (following 12 hours on a plane!). I'll end by sharing with you what I told Shannon on Friday, thanks for bringing me along on this great journey! I found the link to the following youtube clip on www.letsrun.com which features Billy Mills and his amazing race/finish at the '64 Olympics. 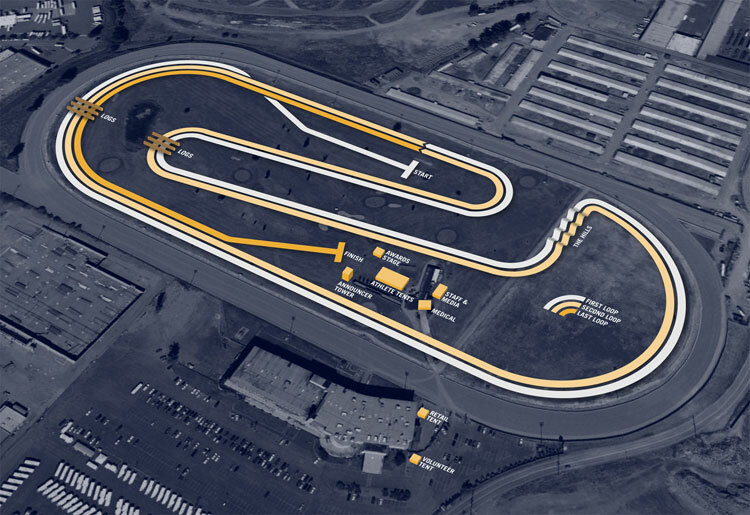 It's in color as opposed to what most have seen before, the amazing last lap in black and white. You can find that at the 2nd video link which features the "LOOK AT MILLS, LOOK AT MILLS" line that gets me every time! The third clip is Billy's own account of his race and how he achieved success through self hypnosis. I just wanted to take the time and write a belated thank you to every that has supported Chico State Distance Running, Gary and/or me in the past year. It was an amazing year and it is unbelievable the amount of support that we/I received throughout. I always dreamed of running on the level that I am running on but to actually see and feel it happening is really unbelievable. This last year was really important in my development into a national class and hopefully soon, world class runner. I was able to go on some great trips throughout the world and I was running and beating some people that I have looked up to for quite a while. I ran times that rank up there with the best distance runners that this country has ever seen and for a while there was a possibility that I would be going to the Beijing Olympics. The Trials were an amazing and very important experience. It was a track meet unlike any other and if you were there then I’m sure you agree that the performances throughout the facility were both exhilarating and inspiring. The Trials were also important because they brought me back down to earth in a very dramatic way. They made me realize that while I had made great improvements this year; I am not invincible and my legs aren’t going to be able to carry me through an infinite number of races. If you came to the trials: thank you, I’m sorry that I saved my worst race of the season for that particular 10k, but it was amazing to hear my name (or CHICO!) from all corners of the stadium even when it was clear that the Olympics were no longer an option. Getting lapped for the first time in my life was a tough pill to swallow but if all of you weren’t there cheering me on then the DNF next to my name would have been even worse. I am rested and training for the next round. Cross-Country is going to be a lot of fun after my red shirt season last year. We will have a great team going to battle in Slippery Rock this year and I am very happy to be a part of it. Last year I had an opportunity to do my own thing by doing a half marathon and racing in Japan but there is nothing like being a part of a cross-country team where we are all striving for the same thing. We have a lot of training and growing to do but if the cards fall in the right place: this season will be a great one aswell.